Flemish painter. The son of a city messenger for Antwerp, he was an apprentice of Sebastiaen Vrancx, although he is not listed as such in the records of the Antwerp Guild of St Luke. He became a master of the Guild in 1612-13. The paintings of his early Antwerp period adopt the style and subject-matter of his master: scenes of skirmishes and robberies on country roads, represented as lively and colourful events. Snayers married a niece of the painter Cornelis Schut on 25 September 1618 and continued to live in Antwerp until the second half of the 1620s. Until 1625-26 he regularly paid his dues to the Guild. Shortly afterwards he moved to Brussels. On 16 June 1628 he obtained citizenship of Brussels and became a master in the local guild of painters. 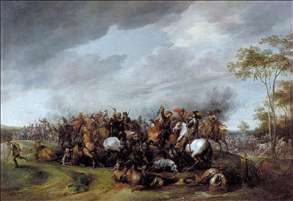 Although he was never appointed officially as court painter to the Archdukes Albert and Isabella, he worked for the Infanta on several occasions, painting scenes in which she herself participated, such as Isabella s Visit to the Siege of Breda (Madrid, Prado). These commissions may explain his move to Brussels. 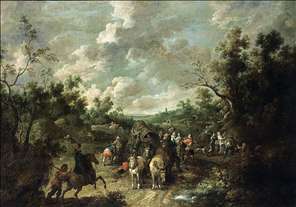 See more details about "A Cavalry Engagement"
See more details about "A Wooded Landscape with Travellers"